My parents married on May 17 at the pretty little Morrison Chapel in the iconic year of 1957. In those days the newspaper carried long, flowery narratives of these events, describing the bridesmaids’ dresses and the bride’s dress, and the music, and the flowers, etc. Marrying was a big event in those days and it was very public and well-attended. But there was a time when marrying was a little different in these hills. 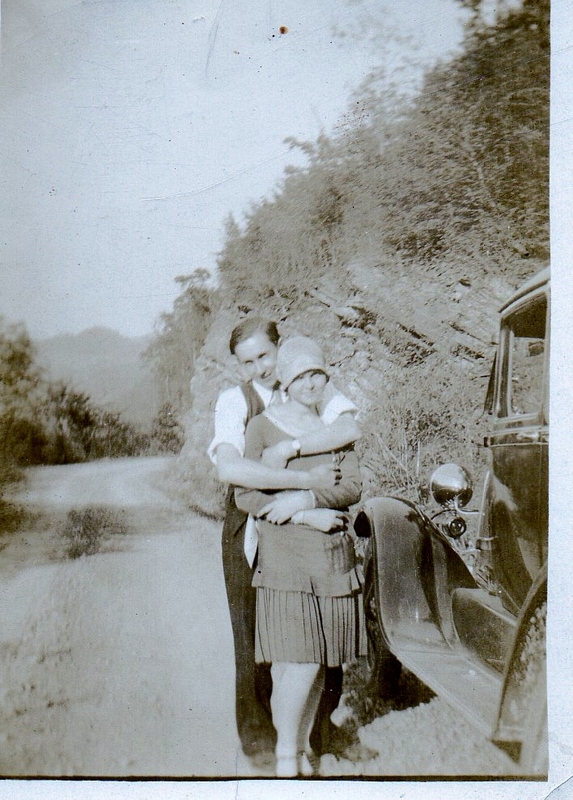 My grandparents, who were married on Dec 10, 1930, chose to be married at home. My Mammaw had a family ceremony in the living room of the old house where she was born. Pappaw used to tell about it, saying that during the prayer the preacher prayed, he was looking for an open window in the room, hoping he could jump out and run away. But, the windows must have been closed because they were happily married for around 66 years, until he died. He told me once that a grandparent of his, Noah B Galloway, rode on horseback to a log house that stood where Kingsport Laundry used to be on Sullivan Street, in the old “Lovedale” community, and “stole” his bride out of a window of the house, and rode off and got married. I always wondered what it would have been like to have taken a horse ride like that! When I first came to Belfast to live, the parsonage was a two-story white farmhouse-style home built on a plot of land directly across the road from the church. It was built about 1912, by Henry C. Stuart, as part of a little settlement near the first schoolhouse in the community. The house had its signs of age, but it made a decent place to hang your hat at night, and at least it had a good front porch with a porch swing. I had been living there a while when I got a knock on the door. I answered the door to find a man, pacing and nervous. I was afraid something was really wrong. He stuttered, “Ppppreacher?” I answered, “I’m the preacher, yes.” “Ccccan you-you-you, uh, uh, mmmmarry us?” I was a little concerned at his nervous state, but I smiled and welcomed him in for a minute. He explained that his fiance and he needed to get married. They were both strangers. They had the appropriate legal documents. I walked them across the road to the church and tried to settle him down while I filled out the license. I asked them about their relationship, how they planned to live, and make a living. He answered satisfactorily to all my questions. I stopped him from talking and looked directly at the young lady, and asked her was this her desire, and she gave an appropriate and lovey-dovey answer, so I knew there was a pretty good chance this was going to happen with or without my signature. So we had a wedding right there in my little office. They repeated the words I gave them, and after saying all the ritual, I pronounced them married. Then the young man, who was wearing blue-jeans and a pullover shirt, reached into the pockets of his jeans and began pulling out dollar bills, one-by-one, and wadded. As he gave them to me, I straightened each one out and smoothed them back out, and kept receiving them from him until there was perhaps 16 or 17 of them. I was so taken with this young couple and their pitiful-looking state, and this act of “paying the preacher” just seemed so difficult. I couldn’t keep it, so after he gave me the last dollar he wanted to give, and after I said something about “how much is she worth?” and we laughed a little, nervously, I handed the dollars back in a bunch and said, “I want to make an investment in this marriage. You take your bride out to eat.” He seemed at once surprised and pleased. They left and I took the license down to Lebanon to the court house for filing. When I moved to North Tazewell, Va., I found that there was a huge tradition there of people coming down out of West Virginia to get married. I asked questions about this because I was getting slammed with couples wanting to get married. The pastor at the Main Street Church got most of the requests, but on his day off, which was Thursday, I would almost always have somebody wanting to get hitched. The couples explained to me that there was a waiting period in the state of West Virginia, and in Tazewell County, Virginia, you could come get a license, find a preacher (usually they came to Methodists because we were full-time, so we were home), and get back home before supper. I usually performed about sixty or seventy a year like this. The pastor at Main Street said he did about 300. Of all these couples, I managed to talk one of them to come to the church. They made a good family and they took my advice to raise their children in the church. They already had some kids from past marriages. I found that a small percentage of these couples were getting married multiple times. When I would see on the license that this was the sixth or seventh marriage, my lecture would get more serious. Then one day one of them informed me that they were getting married to one another all those times. I said, “What?” He told me, “We found out that we could get more money from welfare if she wasn’t married, so we divorced. Then we got to feeling bad about it and wanted to get married again. When we needed more money she had to divorce me again.” Do you think I told them a few things about the meaning of the vows and “til death do us part?” You bet I did. About the time I left North Tazewell, West Virginia took out the waiting period and this habit of traveling to Virginia has now dried pretty well up. In the mean while, I’ve made a decision to only marry people I know. And I’ve decided that marriage counseling has some pretty good effects on helping couples make this step with open eyes and good intentions. This entry was posted in Uncategorized and tagged chivary, couples, divorce, marriage, marrying, preacher, spring, Virginia, wedding, West Virginia. Bookmark the permalink. Very interesting Brad, thanks for sharing. Looks like your Mammaw is ready for a roaring 20’s dance.